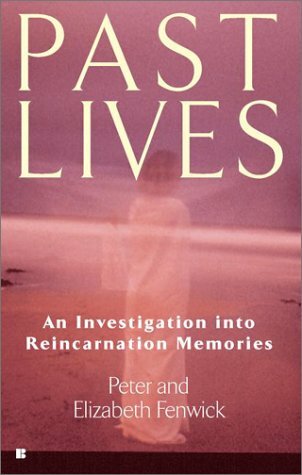 This week I'll share a small little bit from Past Lives: An Investigation into Reincarnation Memories by Peter & Elizabeth Fenwick. It's pretty interesting so far. I've always believed in reincarnation and this gives both sides of the coin to the belief of rebirth; non-believers and believers. I'll just flip to a random pages...this little teaser is talking about and thinking about when people have flashes of their past lives in dreams. "...Such dreams certainly have a reincarnation 'feel' about them, but what makes people who have them believe that they are anything more than ordinary dreams? Is there in fact anything different about them at all? People who have these dreams describe them as being more vivid and real than their ordinary dreams. They lack the bizarre quality of an ordinary dream, and they are often recurrent, so that each time the same scene is played, and each tine the person wakes from it at the same point in the dream. Often these dreams start in childhood and become less frequent as the person grows older, sometimes ceasing altogether." I'm not a believer in reincarnation but I do find it a rather fascinating thought. Carol, there are not a lot of people who do believe. But the more I research and gave info (I can't just believe all willy nilly, I need to do my own research even though I do believe and have had instances of visiting my past lives) the more it seems its possible that many people have "old souls" that have had more then one life.